As summer is arriving very quickly and I like traveling as light as possible while still having a moisturized skin, I decided to find a recipe for an “easily-transportable” lotion. That is how I came across this recipe for a lotion bar. I know, at first it seemed a bit odd to me as well, I wasn’t so sure how great a lotion in a solid form could be. However, now that I have tested it, I can assure you that it is absolutely amazing! After using the lotion bar, you feel like your body is covered with a thin protective layer of moisturizer able to shield your skin from any hazards! Plus, it is such an easy and quick recipe to make and it only needs three main ingredients! Most of which you might already have at home if you tried some of the other recipes (like this one for DIY deodorant). I used this amount of ingredients and it gave me four little lotion bars (such as the one you can see on the pictures). Just as a little reminder, you can find all these ingredients easily in bio/organic shops or online by several providers (see *Notes). As you know already, each one of these ingredients has its specific purpose, and each will help moisturize and will benefit your body. The coconut oil is highly antibacterial and protects and moisturizes the skin. The shea butter is incredibly nourishing and it also protects and moisturizes your skin (the same way it would for your hair) and prevents it from drying out. It also protects the skin’s natural oils. 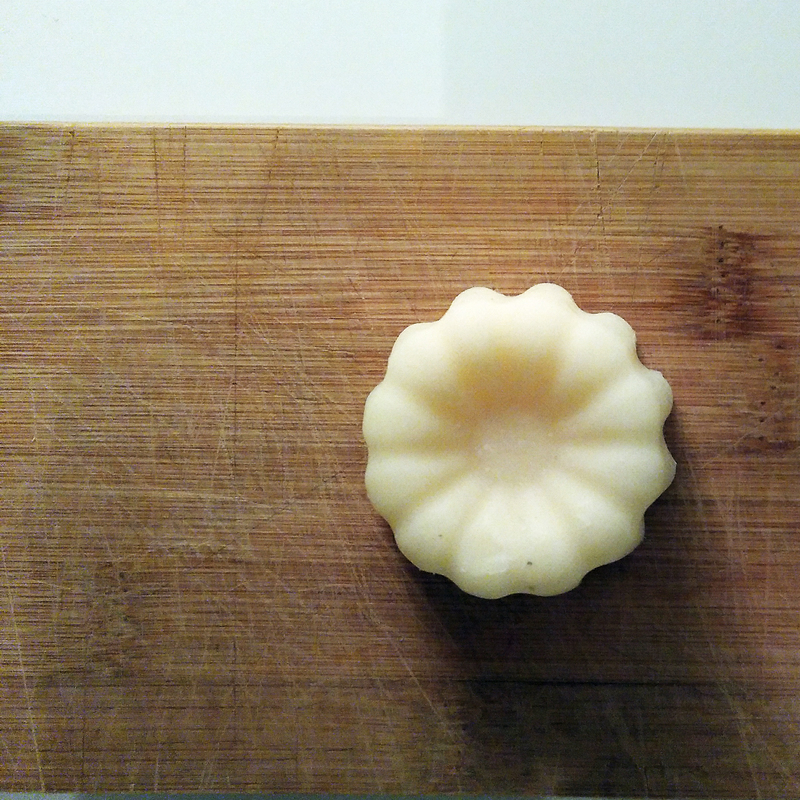 The beeswax helps bring texture to the lotion bar and prevents it from melting when it gets warm. It also protects the delicate parts of your skin. Depending on which essential oil you decide to use, your lotion bar will have different properties. If, like me, you decide to use lavender, it will have great benefits for your skin. I love lavender not only because of its nice smell but also because of its relaxing and calming properties. Moreover, thanks to its strong antioxidants, it also helps to prevent and counteract the negative effects brought about by all the toxins and pollutants present in the environment or coming from stress. It is also very good for healing and works well against acne (you can use a little bit of it on your pimples). Finally, the Vitamin E protects your skin against free radicals and also helps in the conservation of the lotion bar. So now you can get started! 1. 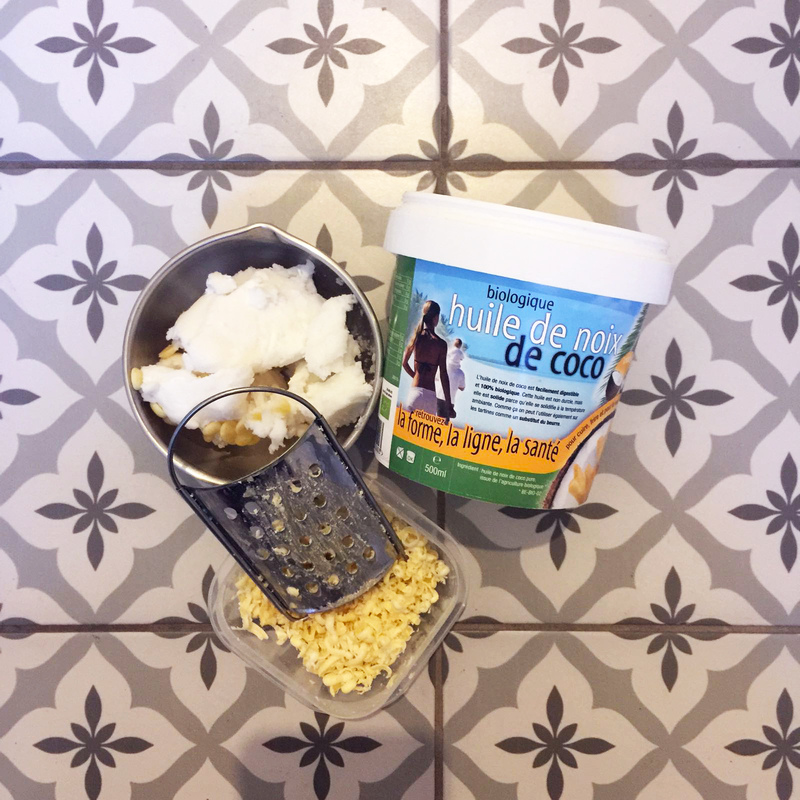 As usual, you need to combine all the ingredients (except the essential oil and vitamin E!) in a double boiler/au bain marie. I usually use a glass container (it could be the empty glass jar of your spaghetti sauce for instance!) and put it in a small pan filled with a little bit of water. Mix until everything is nicely melted. 2. 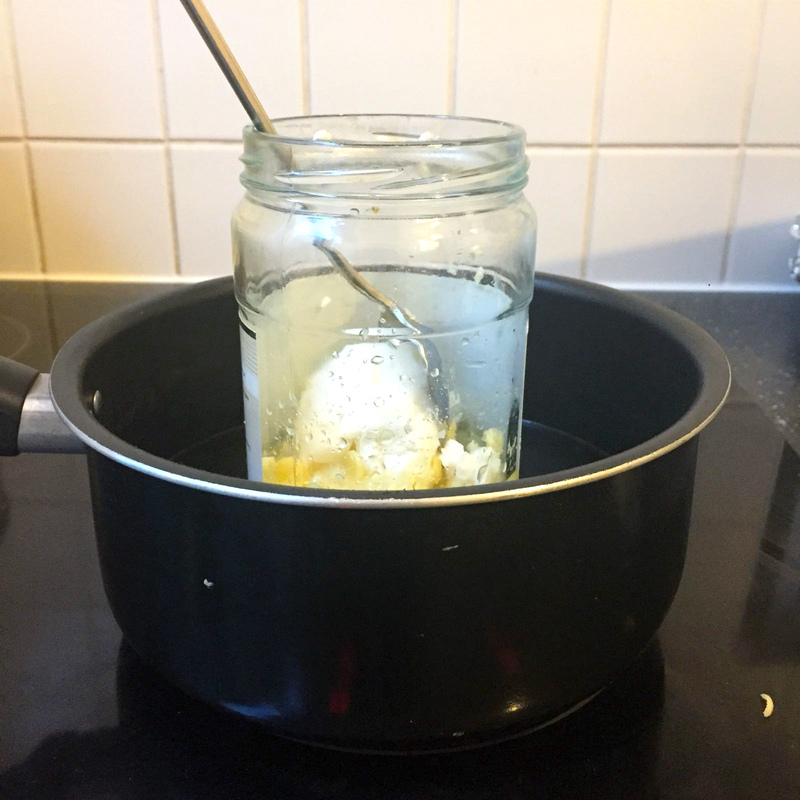 Once you’ve reached the liquid stage and everything is well incorporated together, add the vitamin E and take the jar out of the pan. Then add the essential oil and stir by hand until it is properly mixed. It’s done! 3. 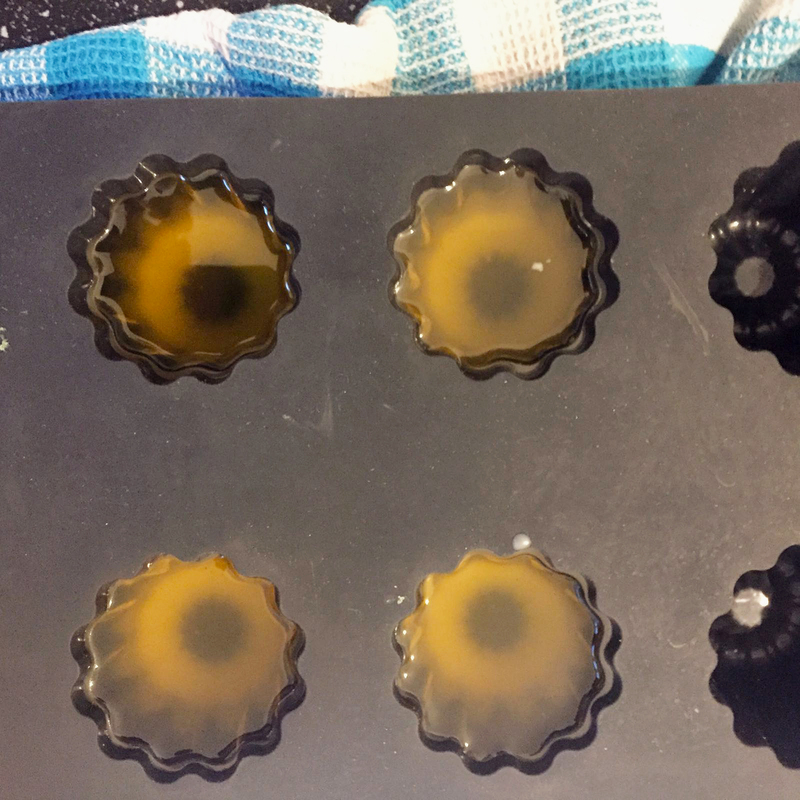 Pour the mixture into the silicone mould and let it cool completely for a few hours. 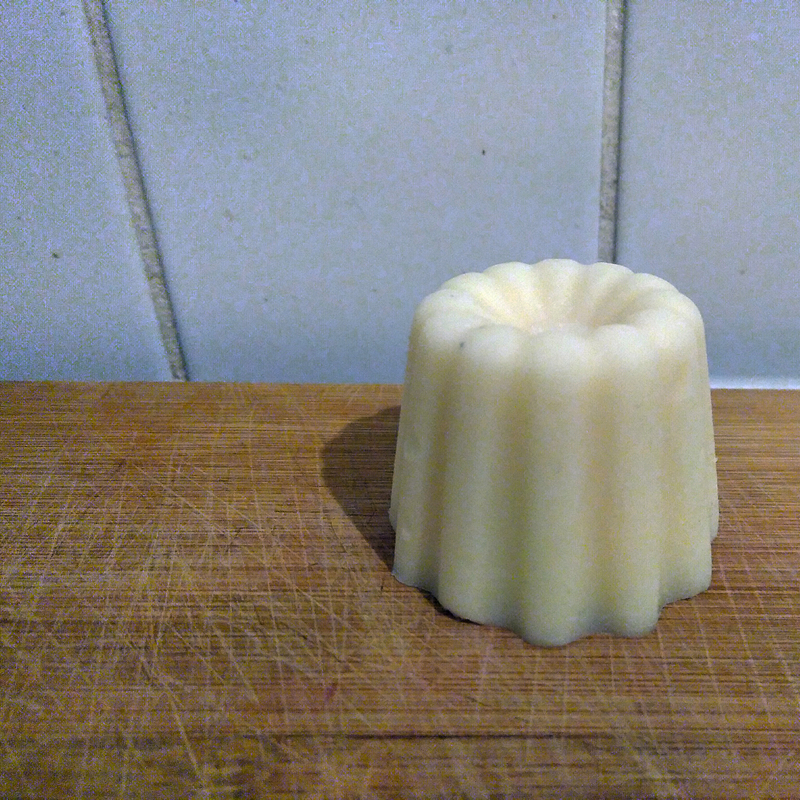 Once it is solid and cool, you can take it out of the mould. You can use the lotion by simply gently rubbing it on your skin. It will leave a very thin layer of highly moisturizing lotion that you can spread with your hands if needed. I use it for my entire skin. I hope you enjoy it as much as I do. It will leave your skin soft and protected! – Here in Vienna, I love the Kosmetikmacherei store, they have absolutely everything you would need to make your own cosmetics, and it is really good value for money and they will give you great advice as well. If you are not in Vienna and/or prefer ordering online, I can recommend this website. I have ordered some of my “material” and ingredients there and it is very good as well, although in French since it is a French company. – If you want to know more about why lavender oil is beneficial for your skin, here is a great article about it. – You should be careful with any type of essential oils during pregnancy, go check the essential oils’ properties if this is the case.